Into the Wind: Everest to End Duchenne, a short documentary by Dave Welton of Animality Productions chronicling a 2015 trek to Mount Everest to raise funds for a treatment for a fatal form of muscular dystrophy, won best documentary short in the first-ever I See You Awards, recognizing and honoring low cost independent filmmakers. 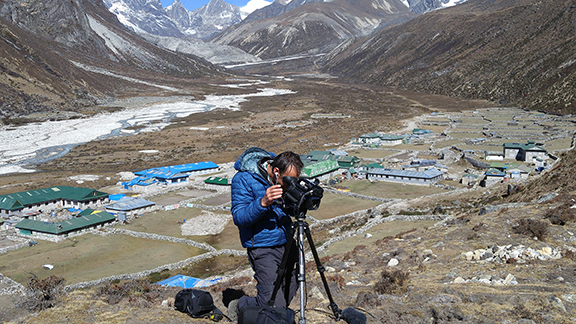 The award-winning film follows eight people – family and friends of children with DMD – who hiked for 17 days in the Himalayan mountains of Nepal to draw attention and raise funds for those who suffer from this terminal illness. Their destination was Everest Base Camp, sitting at nearly 18,000 feet above sea level. With them, they carried a flag with names of more than 700 people who are either living with or had died from DMD. Once at Base Camp, they read every single name into the wind. Part gorgeous travelogue, part heartfelt plea, this documentary is an amazing snapshot of the trails of Everest, and a heartwarming story of just how far we will go for those we love. Aligned with shining a light on under-recognized issues, the I See You Awards fills a niche and creates a platform for recognizing independent filmmakers that is currently missing in mainstream Hollywood. The recognition was awarded at an August 27 ceremony at Bel Air Luxury Cinema in Detroit, MI. “DMD is often called an ‘orphan disease,’ meaning it had not been adopted by the pharmaceutical industry because it provides little financial incentive for the private sector to make and market new medications to treat or prevent it,” said Chris Balch, DMD advocate and Everest team member. “Our goal, of course is to help the thousands of children and young adults suffering from this disease,” Balch said. The trek featured in the film was so successful in raising money that another expedition of trekkers will embark on a trip to Everest Base Camp on September 25. All funds raised in both Everest treks is earmarked for the most promising DMD treatment available. This year’s funds will go to breakthrough CRISPR gene editing research, through Parent Project Muscular Dystrophy, which has achieved significant advances in the recently, thanks in part to the DMD community’s efforts. For more information about the I See You Awards, visit iseeyouawards.com. View the award-winning documentary Into the Wind: Everest to End Duchenne on YouTube.